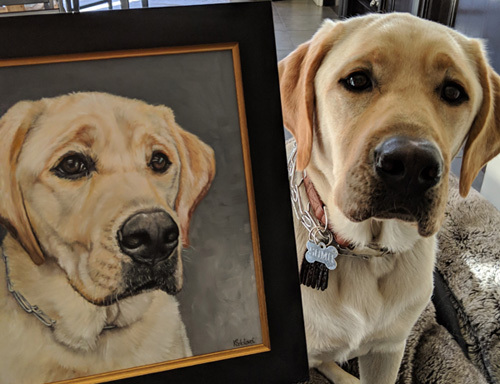 "The painting you did of Chubs was fantastic. The level of detail was incredible and it may sound crazy, but you also captured the personality of Paige's favorite chicken. The way you handled the surprise and presentation to Paige was great and very much appreciated. The painting and experience will be something Paige and all of us remember for years to come. Thank you so much. Great to see you." 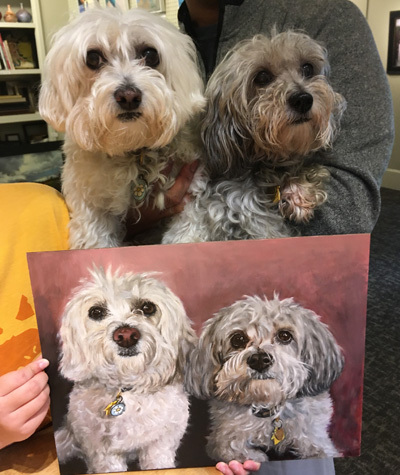 "Both Theo’s portrait and Neely’s came out fantastic! You are not only amazing with the technical aspects, but you really are able to capture the personalities of your subjects. I’m so pleased I thought of commissioning dog portraits as Christmas gifts and believe me, I will let others know as well! Thank you." "Tyson was stunned by the incredible likeness. He couldn’t stop saying thank you. Jane was so moved that she teared up. Four-year-old Millie hugged Casey and said “Look, it’s you!” They were thrilled — and amazed by your talent. So are we. We hope it inspires others to make the same request we did. Thank you so much for making this birthday special." "I love it!!! We were all so impressed with your work. Thank you for sharing your talent with our family. Can't wait to get it home to a place of honor." "Amazing!!! I am crying, he looks beautiful! It is perfect, you are so talented! I never expected it to look that great. We absolutely adore everything about this beautiful painting." "Kate, just want to let you know the painting is a HUGE hit with my daughter - it is truly a wonderful homage to our Duke and a great keepsake for one of his biggest fans, Andrea. Thanks again!" "It is so adorable. You so captured her eyes, tongue, nose, ears, & personality! I love the painting. You have amazing talent, Kate." "You did an amazing job on the commission." "I love the painting of Pup so much because it makes me see qualities in him that were there all the time, but they are just so much easier now to see through the talent of another person, from another doing the display. It's easier to see now. I'm glad you do a simple, almost abstract background, this makes the focus completely on his essence, not on the form." "Kate: I keep meaning to stop in to tell you how much I like the picture of Tonka! I'm always rushing when I drive by the studio, so I'm writing to say -- wow! We have it hanging up in the dining room and it makes me smile every time I walk past. You are so talented!" "I gave Mark Sami's portrait last night. He thinks it's great! He wanted to show it to her right away. Kimi says it totally looks like her. Peter said you really made her head look exactly like her. Wouldn't be surprised if Mark has you paint another one some day, because he also loves her "smile" (which usually means she's panting!) Glad you painted her! It's in the kitchen now, so we can enjoy it!" "She is so outstanding and beautiful. Honestly, brilliant!" "Wow. What a beautiful tribute to sweet Sadie. Thank you. This will mean the world to her owner." "OMG Kate, this is absolutely beautiful! I'm tearing up. I love everything about it. You've captured my baby girl just beautifully! I showed it to my husband and he does too. Honestly Kate, it's perfect and very special to me. Thank you so much! You did a wonderful job of making Sissy look so life like. I'll treasure it always."